Cinemas in the 1930’s featured the adorable antics of the prototypical child star, Shirley Temple. Her blonde curly hair, joyful smile, boundless energy and considerable acting and dancing skills made her a favorite in her era. 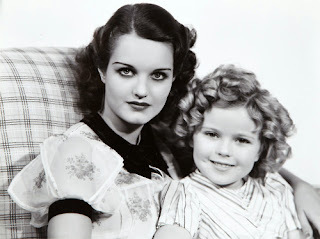 Her charm lasted; growing up in the 80’s, my parents shared Shirley Temple’s films with me. They’re happy, musical, and might be a reasonable alternative to Disney’s animated lineup. 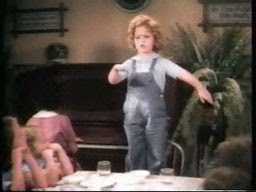 In Curly Top, the seven-year-old Temple stars as Elizabeth Blair, a happy young girl at an orphanage whose energy and boisterousness often get her in trouble with the matrons. Her twenty-year-old sister, Mary, works in the orphanage doing various tasks. One day, Elizabeth is singing a song in the dining hall which riles up the other children. Unfortunately for Elizabeth, the board of directors is visiting this day. The superintendent is a sour old man who is perturbed by her exuberance and demands that she be sent away. Mercifully, another board member – the young, suave Edward Morgan, takes a liking to both Elizabeth and Mary. He wishes to provide for them, and arranges for them to be taken to his house. There’s a catch, though. Edward knows that Elizabeth has been expected to be profusely grateful for everything that ever comes her way. He does not want her to have such expectations on her any more – he wants her to be able to be carefree and to be able to take some things for granted. (In a way, that’s kind of what Maslow’sHierarchy of Needs suggests needs to happen in order for people to thrive –read about Maslow’s Hierarchy of Needs for kids in foster care here…). Morgan decides that the best way to accomplish this is to provide for her without letting it be known that he is the one doing the providing. He crafts a story wherein a fictional friend named Hiram Jones sends for Elizabeth and Mary. They enjoy their new, luxurious lives even though they don’t immediately know the source. 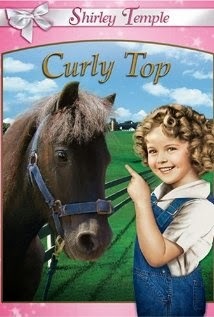 Want to watch Curly Top? See it on YouTube. 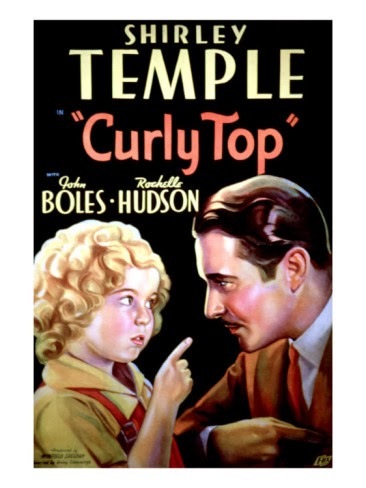 Even in this eighty-year-old film, Shirley Temple’s character captures some of the real concerns that face children in foster care today. She worries about – and is loyal to - her sister. She prays for her pets. She tries to ingratiate herself to those in power over her, but sometimes her age-appropriate behaviors land her in hot water and – unfortunately – threaten the stability of her placement. Like many children in foster care, Elizabeth’s future is determined by the thoughts (and whims, and reactions) of adults. Children in foster care often are placed or moved in response to thought processes that they never knew about; they’re in the dark about the people driving their lives – much as how Elizabeth didn’t understand how or why she ended up in her new home. In Elizabeth’s case, the change was a positive one. I’m hoping that for your kids, the change was also a positive one (and the fact that you’re reading about how to use film to have open conversations with them suggests that it was!). But some of the changes that they’ve experienced in their journey through foster care or adoption may have been negative – and certainly several of those changes involved loss. Not knowing how these changes come about can certainly be disempowering to children – and can also threaten their sense of stability. Communication is so important in every relationship – even the relationship between a child and the parents and professionals making decisions on her behalf. The loyalty and love between sisters Mary and Elizabeth is portrayed very strongly. Even though they are stern, the orphanage matrons obviously love the children in their care – even the exasperatingly exuberant Elizabeth. Edward Morgan’s butler is a particularly good friend to Elizabeth. She is uncertain of household rules, and she asks the butler to tell her if she ever does anything inappropriate. It’s helpful to have someone kindly explain what the expected behavior is in a new environment. Elizabeth eventually is able to express to Edward Morgan that she wants to live with him forever. And – happily – she gets to! Edward Morgan is dedicated to Elizabeth. He celebrates what other people complain about. He even writes a song about her! Curly Top isn’t just set in a different time period. It was made in a different time period. Kids will need to be helped to understand the differences (and perhaps, the similarities) between life today and life in the 1930’s. Also – Edward Morgan adopts Elizabeth and marries her sister Mary. This is done innocently, and I think it’s more confusing than creepy. Kids need to know that this won’t happen today. It does seem, for a while, that Elizabeth will be removed from the home. It seems that the orphanage decides to punish Elizabeth by taking away her pets. One adult tells Elizabeth, “You’re a bad and wicked child – you know that, don’t you?” She is called a problem and incorrigible. As much as Edward Morgan means well, his character poses some significant problems. Admittedly, some of these problems may be due to the age of the film – but some of them, not so much. He approaches Elizabeth as a benevolent, wealthy, and to some extent omnipotent helper. He does care for her, but his care is delivered in a somewhat less-than-therapeutic way. He sits down with her and asks her name. She says, “Elizabeth Blair.” He says, “I’ve got a much better name for you than that.” Later, he decides to legally adopt her while at the same time hiding his identity from her. He tells the orphanage director, “I’ll adopt her, but I’ll tell her I’m acting for a client.” Morgan hasn’t taken an interest only in Elizbaeth. He eventually proposes to marry her sister Mary. Romantic in the film – problematic in real life. Curly Top is worth seeing. I noted several concerns, but I think they’ll be overcome fairly easily. At its heart, this is a happy, kid-friendly, musical movie about a family being made. Secrecy is replaced by truth and a child finds a loving family. (If your child has previously lived in a group home) – I know you used to live in a large home with many children. What do you remember about it? How was it like the Lakeside Orphanage? What was different about it? Elizabeth didn’t always know where she would be living or who her parents would be. Do you ever feel confused? What would you like to know? What about writing a song about your child?